Angelina Jolie was spotted out and about with her estranged father Jon Voight and her 9-year-old daughter, Vivienne in Sherman Oaks, California on Monday, August 14. Many fans can’t help but wonder if Angelina might be using her father for a little positive PR after the actress was slammed for her insensitive child casting techniques for her new film, First They Killed My Father. If there’s one thing that Angelina Jolie hates, it’s bad PR. The Hollywood actress was harshly criticized for supposedly exploiting children in her new movie. The film’s casting directors allegedly placed money in front of disadvantaged children and asked them what they needed the money for before taking it away to elicit a reaction. That’s why Angelina is now determined to change the headlines. Earlier reports indicated that she and Brad Pitt were calling off their divorce. And because that didn’t work, she’s now using Jon Voight to help soften her public image a little bit, too. For Brad Pitt, he refuses to play Angelina Jolie’s PR and media games. That’s why his team of handlers flat out denied reports that the ex-couple’s divorce has been put on hold. It might have slowed down but that doesn’t mean it’s not going to happen altogether. Brad was subjected to a nasty smear campaign last year and missed the opportunity to see his children on Father’s Day. Many fans believe that there’s no way that he would move one step back to be with Angelina when he’s worked so hard to move forward in his life. That’s why many observers believe that Angelina has moved on to Plan B: her father Jon Voight. Sure, they’ve had plenty of ups and downs in their relationship, but Angelina is making it pretty clear that she needs her father Jon in her life right now. And while no one knows just what is going on behind closed doors between them, Angelina is determined to show the world that she at least has her father Jon Voight by her side. Of course, Angelina Jolie is yet to make any comments about her Brad Pitt divorce or what her next move will be for that matter. But for now, many fans say that she’s doing whatever it takes to convince the world that she’s in control. In the meantime, don’t forget to check back with CDL for all the latest news and updates on Brad Pitt and Angelina Jolie’s divorce right here. 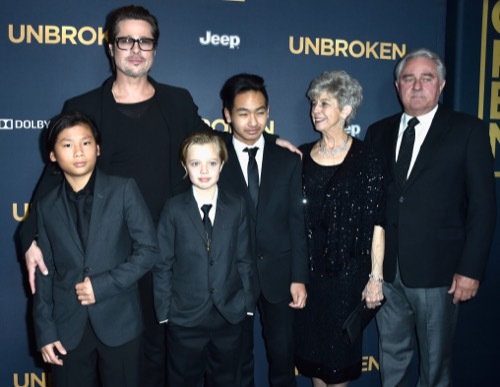 Brad Pitt Uses Father-In-Law Jon Voight In Custody Battle Against Angelina Jolie: Divorce Takes Nasty Turn For Actress?